A Tail of 3 Kittehs: Sandi "Claws"
At least HIS tail will grow back. As for the Hopper ..well, she's a really good bugger! We are delighted to meet you. I find it very interesting that a handsome ginger mancat is such good friends with two girlcats. I have many mancat friends and am a bit wary of the sneaky girlcats - but maybe yours are not sneaky. We look forward to reading your bloggie and hearing about adventures you have. Hawksfoot rocks! Your blog is awesome, I just visited it!! Thanks for coming by to play! I see you on Pasha's blog. Pasha is my BBF (my best bloggie friend). Glad to meet you too! thankks for coming by and please visit again!! Yes, we have hoppers and lizards just like Pasha. We are Kalifornia Kittehs. Anyway, it's terrific to meet you all, welcome to the Cat Blogosphere! It's mice to meet you! Sandi is the bestest hunter, even though she prefers to stay inside most of the time. Thanks for the big welcome! Are you available for lessons? Maybe an online-blogger-kitty class ... we do a C+ job of chasing buggers & lizzies, but we're in the F- category when it comes to catching them! Oooh, what a good idea. We got really good at catching! Sandi gets birdies and we're all really good at getting the mousies. The trick is teamwork when you can and precision when you're alone. Thanks for the bloggie post idea! We don't chase the birdies but we do love to watch them - we've tried to be friends with them by going on the roof but they fly away before we can get close. Come by and see us when you've got time and we hope we will be good friends. Oh I love your bloggie. I think Lucy looks like my beautiful Sandi Claws! Hi there! It's nice to meet all of you! Wow, we've never caught a leezard...we don't have them here on our island. We look forward to learning more about all of you! Wow, no leezards? What is your island? Do they have birdies or mousies? Hello, thank you for stopping by! I can't wait to see your bloggies too! Wow! That lizard thing looks scary... we don't really have them up north, but a pray-mantice was on the screen yesterday, he's lucky he was up higher than we could jump. Welcome to the blogosphere, we're really new too. Come by for a visit! Oooh yes, a pray-mantice would be scary! But probably fun to catch too! I'm gonna look at your bloggie now! Thanks for visiting us...come back soon! Hi there you kittahs. Good to meet you. We are always anxious to meet new friends. 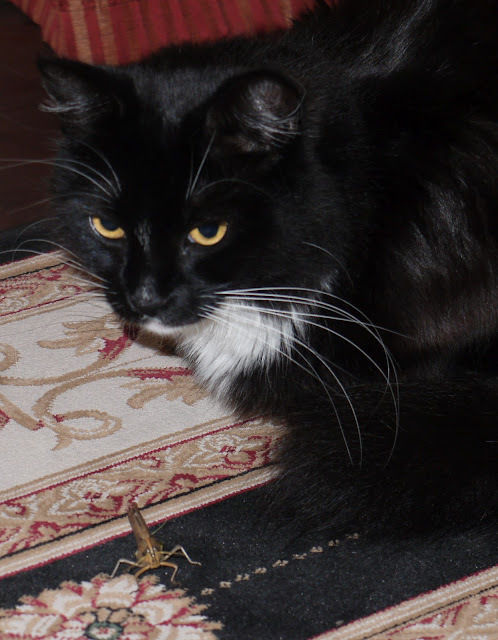 That is a huge grasshopper you have there. You must be quite the hunter. Hope you have a super Sunday. We have lots of fun over here, so please come back and see our adventures. I can't wait to see your blog too! Thank you Old Kitty! You must know everythiiing of the world if you're an old Kitty. I'm a new kitteh and I know everythiiing too! I can't wait to see your blog! Please come back and visit us!